Over 30 publishers have signed on to offer specials to indie booksellers during various dates between now and January 2019. 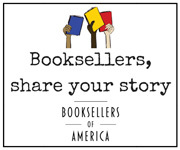 These publisher and university press specials, which apply to a wide array of frontlist and backlist titles, are being offered in support of the American Booksellers Association’s sixth annual celebration of Indies First on Small Business Saturday, to be held this year on November 24. As each special offer becomes available, booksellers can use the promotional codes listed on the downloadable Excel spreadsheet below. The spreadsheet will continue to be updated as publisher offers come in.